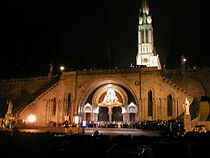 The Sanctuary of Our Lady of Lourdes or the Domain (as it is most commonly known) is an area of ground surrounding the Catholic shrine (Grotto) to Our Lady of Lourdes in the town of Lourdes, France. The Sanctuary is a destination for pilgrimage; sick pilgrims are reputed to be miraculously healed by Lourdes water. This ground is owned and administered by the Roman Catholic Church, and has several functions, including devotional activities, offices, and accommodation for sick pilgrims and their helpers. The Domain includes the Grotto itself, the nearby taps which dispense the Lourdes water, and the offices of the Lourdes Medical Bureau, as well as several churches and basilicas. It comprises an area of 51 hectares, and includes 22 separate places of worship. There are six official languages of the Sanctuary: French, English, Italian, Spanish, Dutch and German. Grottos intended as replicas of the one at Our Lady of Lourdes, and other grottos in honour of Our Lady of Lourdes, are often described as "Lourdes grottos". Beginning on 11 February 1858, a 14-year-old peasant girl named Bernadette Soubirous claimed to have experienced a series of apparitions of a girl dressed in white and with a blue belt around her waist, who eventually introduced herself as the Immaculate Conception, a name by which the Virgin Mary was known. On land bordered by a loop of the Gave de Pau river is an outcrop of rock called Massabielle, (from masse vieille: "old mass"). On the northern aspect of this rock, near the river bank, is a naturally occurring, irregularly shaped shallow cave or grotto, in which the apparitions took place. At the time of the apparitions, the grotto lay well outside town, on common ground which was used by the villagers variously for pasturing animals, collecting firewood, and as a garbage dump, and it had a reputation for being an unpleasant place. The figure always appeared in one place, a niche above the main cavity of the grotto, in which a wild rose bush was growing. Among the instructions from 'the Virgin' were "Go and drink from the spring", "Go and tell the priests to build a chapel here", and "Have the people come here in procession". These three instructions in particular were to prove pivotal in the development of the Domain and its ceremonies. Public interest in the apparitions grew, and curious visitors began to be replaced by pilgrims from increasingly far away, drawn by compelling stories of apparitions and miracles. A local priest, Abbé Dominique Peyramale, together with his bishop, Monsignor Bertrand-Sévère Mascarou Laurence, bought the grotto and the land around it from the commune in 1861, 3 years after the apparitions. Immediately they set about modifying the area to make it more accessible to visitors, and started work to build the first of the churches, which is now known as the Crypt. In 1864, the Lyonnais sculptor Joseph-Hugues Fabisch was commissioned to create a statue of Our Lady of Lourdes based on Bernadette's descriptions. Although it has become an iconic symbol of Our Lady of Lourdes, it depicts a figure which is not only older and taller than Bernadette's description, but also more in keeping with orthodox and traditional representations of the Virgin Mary. The statue rests in the niche where the Virgin appeared to Bernadette. The original wild rose bush was destroyed shortly after the apparitions by pilgrims seeking relics, but a newer one has been planted nearby. Due to French political upheaval resulting in an enforced separation of Church and State, the property and grounds of the Domain were confiscated from the Church and returned to the ownership of the town in 1910. The then bishop, Mgr. François-Xavier Schoepfer, contested this confiscation and was permitted to rent the Domain from the town until the outbreak of World War I in 1914. 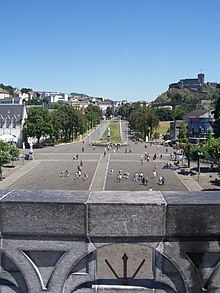 Later, a visit to Lourdes by Marshal Pétain in 1941 provided official recognition of the Domain. Church officials successfully petitioned Pétain to allow the Church to reclaim ownership of the Domain. The Basilica of the Immaculate Conception, commonly known as the Upper Basilica, Lourdes. The Bishop of Tarbes and Lourdes is responsible for the spiritual governance of the Domain. He appoints a local representative, who is called the Rector. The Domain is run independently of the parish of Lourdes, which is responsible for the spiritual needs of the Lourdais themselves. Thirty full-time chaplains work in the Domain, from dioceses and religious communities worldwide. As of 2010[update] there were 292 full-time lay employees and a further 120 seasonal employees working in 63 different divisions, with an annual running budget of €18 million, 90% from donations. The Domain is open all year round. In winter there are many fewer visitors, a reduced timetable of services and devotional activity, and no processions. The winter season runs from 1 November (the feast of All Saints) until Easter. On 11 February, the Feast of Our Lady of Lourdes, a full programme of activities usually takes place. The Domain is fully active between Easter and All Saints each year, and has a programme of devotional activities including Mass, processions (see below), Adoration of the Blessed Sacrament, and the Sacrament of Reconciliation. Many activities are carried out in several languages; in some services the liturgy is repeated in different languages. The grounds are open daily from 5 am until midnight; outside these times the Grotto is accessible via the Lacets Gate behind the Upper Basilica. An estimated 200 million people have visited the shrine since 1860 . The Roman Catholic Church has officially recognized 70 miracle healings, the 70th of which was the cure of Sister Bernadette Moriau, recognised on February 11, 2018. About 800 tonnes of wax is burnt annually in devotional candles. The Domain publishes the monthly Lourdes News, with news and featured articles about the Domain and Lourdes generally. Lourdes water flows from a spring at the same spot where it was discovered by Bernadette. The original spring can be seen within the Grotto, lit from below and protected by a glass screen. Pilgrims drink Lourdes water due to its reputed healing power. The water is accessed from individual tap located between the grotto and the baths, The water from Lourdes was thoroughly analysed by independent chemists in 1858 and 1859, and does not appear to have a latent power to cure and has no special scientific or medicinal properties. Despite this, the water is itself a strong symbol of devotion for Lourdes pilgrims, and many buy statues and rosary beads containing small vials of it, and take home large plastic containers of it. The Blessed Sacrament procession is held daily at 5:00 pm. The procession begins at the open-air altar on the prairie across the river from the grotto and is led by sick pilgrims followed by a priest, bishop or cardinal carrying a monstrance containing the Blessed Sacrament. Typically the bearer of the Blessed Sacrament is sheltered from the elements by a mobile awning/canopy, called a baldachin, carried by four assistants. The Blessed Sacrament is accompanied by bearers carrying candles, incense burners or other devotional symbols. These bearers are lay helpers chosen from the pilgrimages. Following directly behind the Blessed Sacrament, both during the procession and the Blessing of the Sick, will be a representative group of doctors from the various pilgrimages. Lastly, there are groups of pilgrims, some following their parish or diocesan banner. The procession makes its way across the river, past the Crowned Statue, along the esplanade and down into the St. Pius X underground basilica where the sick pilgrims are placed at the front of the altar. During the procession there are meditations, prayers, hymns and chants, in several languages. When all the participants have assembled, there is a period of Eucharistic Adoration, followed by the Blessing of the Sick. During extreme weather conditions, the procession will take place inside the basilica. The Torchlight Marian Procession takes place daily at 9.00pm. It begins near the Grotto and continues around the esplanade ending in the Rosary square. In extreme weather an indoor ceremony may be held in the Underground Basilica instead. The procession is led by sick pilgrims followed by volunteers carrying a replica of the Cabuchet Statue of the Virgin Mary. Most participants carry a candle. The focus of this procession is the rosary. All five decades are recited, usually in a variety of languages. The Lourdes Hymn is also sung, with verses in different languages. Intercessions may be invoked followed by the Laudate Mariam. There is a final blessing in Latin, and then an invitation to exchange the Sign of peace with fellow pilgrims. The Crypt was the first of the churches to be completed in the Domain, and is today among the smallest. Construction was started by Abbé Peyramale and Mgr. Laurence. Bernadette's father worked on its construction and was present at its official opening, on Pentecost Sunday, 1866. The nave is small and a notable feature as are the enormous pillars which support the weight of the Upper Basilica, which was constructed on top of it. The Crypt is entered along a corridor, whose entrance is dominated by a large bronze statue of St. Peter, holding the Keys of the Kingdom of Heaven. Opposite stands a statue of Pius X. The walls of the corridor and nave are lined with small marble plaques, known as ex voto plaques, donated in thanks of spiritual favours received. The Basilica of the Immaculate Conception, known widely as the Upper Basilica, was the second of the churches to be completed, consecrated in 1876. It is an impressive, elaborate building in Gothic style, designed by architect Hyppolyte Durand, and on one side seems to emerge directly from the rock of Massabielle (the sanctuary is directly above the Grotto). The walls are lined with ex voto plaques, and banners from official National Pilgrimages of the past. It has a series of stained-glass windows depicting various events in the story of Lourdes; the clerestory windows depict Mary as the Second Eve. The exterior is dominated by a 70m spire, and two lesser spires (not completed until 1908). Above the entrance is a mosaic depicting Pope Pius IX, who defined the dogma of the Immaculate Conception in 1854. The Rosary Basilica is the third of the churches to be completed, in 1899 and designed by architect Leopold Hardy. It was consecrated in 1901 and has a capacity of 1,500 worshippers. Its style is influenced by Byzantine architecture. The nave is open and circular, surmounted by a dome. The exterior of the dome is surmounted by a dramatic gilded crown and cross, which were a gift from the people of Ireland in 1924. The exterior facade of the basilica was modified in 2007 to include a depiction of the Luminous Mysteries, which are not a part of traditional fifteen, but another rosary, by Pope John Paul II in 2002. The open space in front of the Rosary Basilica is known as Rosary Square. The entrances to the Crypt and the Upper Basilica, both of which are built on top of Massabielle, are far above ground level. To facilitate access, two enormous ramps were constructed, which curve down either side of Rosary Square. 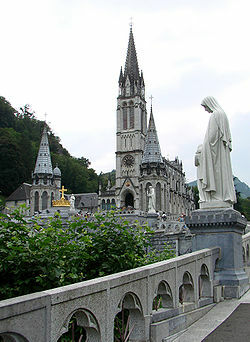 The image of the entrance of the Rosary Basilica, flanked by the two ramps and surmounted by the spires of the Upper Basilica, has become one of the iconic symbols of Lourdes, and a stylised form of this image has been adopted by the Domain itself as its logo. The Statue of the Crowned Virgin, often known as the "Crowned Statue" (French: La Vierge Couronnée), stands across Rosary Square from the Rosary Basilica and faces the entrance. This prominent statue is a familiar landmark and a traditional meeting point. The statue is 2.5m high and cast in bronze, painted white and blue in the traditional colours. Her rosary is of the Birgittine style and incorporates six decades. Behind the Crowned Statue is the Esplanade, a large open walkway which is used for the processions. The Basilica of St. Pius X, known as the Underground Basilica, is the largest and most controversial of the Domain's churches. 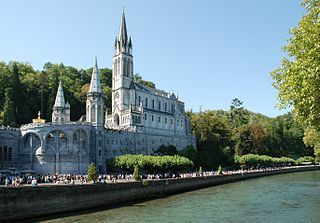 It was designed by the architect Pierre Vago and completed in 1958 in anticipation of the enormous crowds expected in Lourdes for the centenary of the Apparitions. A modern, concrete building, it is almost entirely underground (part of the building lies beneath the Boulevard Père Rémi Sempé above). When full it can accommodate 25,000 worshippers. The most recent of the major centres of worship is the Church of St. Bernadette, which was consecrated in 1988. It was built opposite the Grotto across the River, on the spot where Bernadette stood during the final (18th) Apparition. The Church of St. Bernadette is a modern building with comparatively little adornment. It was designed to allow as much natural light as possible into the nave, and light-coloured materials have been used, making it noticeably brighter than the Underground Basilica. It was designed by the architect Jean-Paul Felix. It is also a more versatile building. The nave has provision for 5,000 seated worshippers and 350 wheelchairs, but partitions can be drawn which divide the nave into smaller sections. In addition, it includes the Hemicycle, a large lecture room which may be used for worship, and an assortment of conference rooms and smaller rooms which may be used for devotional or non-devotional activity. The Chapel of Reconciliation formerly occupied a site slightly more remote, at the entrance of the Upper Stations of the Cross. It was moved several years ago into a more prominent position, into the building previously known as the Accueil Notre Dame, near the Crowned Statue and facing the Esplanade. The Chapel of Reconciliation is somewhat unusual in that no masses or other services take place there; instead it is given over entirely to the Sacrament of Reconciliation. Priests from different countries observe a duty roster, which means that, at almost any time of day, pilgrims from Europe (and occasionally further away) can find a priest who will hear their confession in their own language. St. Joseph's Chapel is situated at the far end of the Esplanade, near St. Michael's Gate. It is a modern, concrete church, mostly underground, with little natural light. It was also designed by Pierre Vago, and was consecrated on 1 May 1968. It has provision for 450 seated worshippers and 80 wheelchairs. Begun at the end of 2014, work on the Project of the Grotto Heart of Lourdes was completed in early spring 2018. The Buildings of France and the INCA architectural firm took part in this project which lasted four years. In contrast to the grandness of Rosary Square and the various basilicas, the grotto at Massabielle where St Bernadette's visions took place is very simple and stark. The recess of the grotto itself is undecorated, although a plain stone altar and lectern have been placed there so that Mass can be celebrated. Above the main recess is the niche where the apparitions took place and Fabisch's statue now stands. A large stand of candles next to the altar is kept burning throughout the year. During the pilgrimage season, 2 pilgrimage masses are usually celebrated each morning at the grotto. The spring Bernadette is said to have dug can be seen at the rear of the grotto, shielded by a glass cover. When Mass is not being celebrated, pilgrims can process through the grotto where it is traditional to touch the rocks directly under the statue; indeed so many people have done this that the stones have become polished. Also at the rear of the grotto is a metal box into which written prayers or petitions may be deposited; they are collected daily and burnt. Rows of benches allow visitors to sit and pray or contemplate. Pilgrims are asked to remain silent while in the vicinity to create an atmosphere of devotion. One of the spots where Bernadette prayed to the Virgin is marked by a special paving slab. Some of the rock walls around the grotto bear clear signs of deliberate alteration, presumably to improve access for pilgrims. It is therefore no longer clear what the original configuration of the grotto was. At least one contemporary account describes a series of chambers behind the statue's niche, which can only be reached by climbing "like a lizard" through clefts in the rocks. 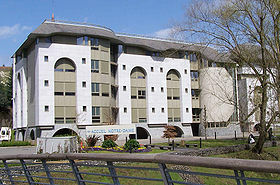 Across the river from the grotto and the churches is the Accueil Notre Dame, a modern facility built in 1996 to house sick pilgrims during their time in Lourdes. The Accueil Notre Dame was built to replace the two older Accueils that were present within the Domain. The old Accueil Notre Dame stood opposite the Underground Basilica, and has been extensively remodelled, being divided into two buildings by removing a section. One building now contains the Chapel of Reconciliation, which used to be the refectory, and also houses the convent of the Sisters of Charity of Nevers. The other section is now known as the Accueil John Paul II, and contains several chapels (e.g. St Cosmos & St Damien), the First Aid post and Dispensary, and the offices of the Hospitalité. The other was the Accueil St. Bernadette, which stood across the river from the old Accueil Notre Dame, and was demolished to make way for the new one. Since Easter 1997 sick pilgrims from all over the world have been housed in the Accueil Notre Dame, an airy modern building. The Accueil is organised into two wings, each consisting of six storeys, with the Reception area on the ground floor and the Transit Lounge on the fifth. Each floor from one to four is named after a specific saint, with female saints honoured on one side and male ones on the other. Each floor has a central refectory area where pilgrims congregate to eat. The rooms, each with bathroom and shower, accommodate from one to six people. Each room has a window, with some fortunate ones having a view of the Grotto, and storage cupboards and a table and chairs. Each room opens onto a communal area. Linking the two sides is the Administration Area, with two panoramic lifts bringing visitors to each floor. The administration offices are on the sixth and seventh floors, and there are kitchens for each side. Typically, pilgrims arrive at the Accueil Notre Dame in specially adapted buses, either from Lourdes airport or train station, and will be welcomed in the transit lounge from where they are taken to their rooms. Another accueil, the Accueil Marie St. Frai, is located a short distance outside the domain; it is similar in design and atmosphere to the Accueil Notre Dame. Across the Gave from the Grotto is a wide, open, uncluttered space covered with grass and known in French as the prairie, or in English, the meadow. In the corner of the prairie is the tent-like Chapel of Adoration, consecrated in 1995 and given over entirely to veneration of the Blessed Sacrament, There is also an open-air altar for outdoor ceremonies. Also on the prairie is a series of candle holders called 'brulières' where pilgrims can place candles of varying sizes. Some pilgrimages transport large candles from their respective parishes. The brulières are tended by feutiers, attendants whose job is to ensure candles are burnt safely and evenly and to remove the trays of melted wax which collects under each brulière. In 2002 the Water Walk was introduced, across the Gave and slightly downstream from the Grotto. It consists of a series of nine stations at which there is a small Lourdes water font. Since the earliest of the Lourdes apparitions, there has been intense debate regarding their veracity. 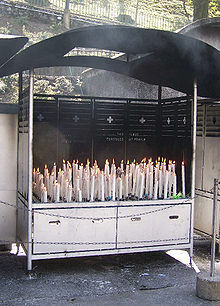 The earliest investigators, including the priest Abbé Dominique Peyramale and the Chief of Police, Dominique Jacomet, were both initially convinced they were dealing with a hoax (both later changed their minds), and several researchers have since called several aspects of the Lourdes phenomenon into question. The apparitions at Lourdes took place against the backdrop of a rich network of popular piety, which was common throughout the Pyrenean region in the 19th century. In the decades leading up to 1858, several children in small Pyrenean villages (on both sides of the border) claimed to see apparitions of the Virgin Mary in remote locations. Many consider that Bernadette was simply repeating a well-tried trick to gain attention and notoriety. Believers argue that this is not likely, since Bernadette claimed the Lady called herself "the Immaculate Conception", referring to a doctrine formally established only four years previously, and which Soubirous may not have been familiar with. Modern Lourdes contains many souvenir shops. Some visitors may dislike the commercialism of parts of Lourdes, with neon-emblazoned shops overflowing with what Malcolm Muggeridge, a supporter of the shrine, called "tawdry relics, the bric-a-brac of piety". 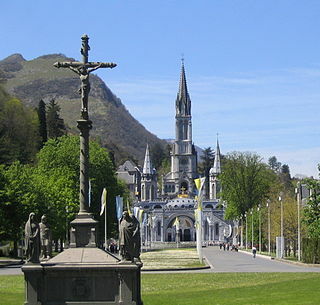 Lourdes has been called the "Disneyland of the Catholic Church". Critics argue that the Lourdes phenomenon is nothing more than a significant money-spinner for the town and the region, which therefore has a strong vested interest in keeping the pilgrims coming. The church, however, distances itself from commercialisation. The many trinket stalls are privately owned, and hawkers are strictly forbidden inside the sanctuary. Many people remain sceptical about Lourdes and its supposed healing power, arguing that any improvement offered by the shrine is no more than the placebo effect, and that the ceremonies and processions are no better than faith-healing on a grand scale. The origin of this large church complex inspired by a vision in France is similar to the origin of the Basilica of Our Lady of Guadalupe in Mexico. Bernadette Soubirous's vision of 1858 which gave rise to the growth of Lourdes is similar to the case of Juan Diego's vision in 1531 in Mexico. Both saints reported visions in which a miraculous lady on a hill asked them to request that the local priests build a chapel at the site of the vision. Both visions had a reference to roses. Like Our Lady of Lourdes in France, Our Lady of Guadalupe is a major Catholic symbol in Mexico and the Basilica of Our Lady of Guadalupe complex is one of the largest and most visited Catholic church in the Americas. ^ Ruth Harris, Lourdes: Body and Spirit in the Secular Age, Penguin Books, 1999, p. 52. ^ Ruth Harris, Lourdes: Body and Spirit in the Secular Age, Penguin Books, 1999, p. 53. ^ a b c Oliver Todd, The Lourdes Pilgrim, Matthew James Publishing, 2003, p. 41. ^ a b Ruth Harris, Lourdes: Body and Spirit in the Secular Age, Penguin Books, 1999, p. 365. ^ Oliver Todd, The Lourdes Pilgrim, Matthew James Publishing, 2003, pp. 52–53. ^ Oliver Todd, The Lourdes Pilgrim, Matthew James Publishing, 2003, p. 77. ^ Oliver Todd, The Lourdes Pilgrim, Matthew James Publishing, 2003, p. 151. ^ Oliver Todd, The Lourdes Pilgrim, Matthew James Publishing, 2003, p. 155. ^ Oliver Todd, The Lourdes Pilgrim, Matthew James Publishing, 2003, p. 42-3. ^ Oliver Todd, The Lourdes Pilgrim, Matthew James Publishing, 2003, p. 43. ^ Oliver Todd, The Lourdes Pilgrim, Matthew James Publishing, 2003, p. 45. ^ Oliver Todd, The Lourdes Pilgrim, Matthew James Publishing, 2003, p. 46. 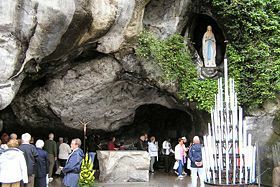 ^ "Inauguration du Projet Grotte, Coeur de Lourdes - [ Site d'informations en ligne, sur Lourdes et le Pays de Lourdes]" (in French). 4 April 2018. ^ "Lourdes : les travaux de réaménagement de la Grotte de Massabielle débutent mercredi". France 3 Occitanie (in French). Retrieved 8 January 2019. ^ Ruth Harris, Lourdes: Body and Spirit in the Secular Age, Penguin Books, 1999. ^ Francis Trochu. Saint Bernadette Soubirous:1844-1879. Pantheon. pp. 156–158. ^ Muggeridge contrasts the "tawdry relics, the bric-a-brac of piety" with the spiritual phenomena he describes experiencing in Lourdes. (Jesus Rediscovered, A Visit To Lourdes, Fontana 1969. ^ "Consuming Visions—Mass Culture and the Lourdes Shrine, Suzanne Kaufman", Book reviewed by Lawrence S. Cunningham University of Notre Dame, Commonweal 23 September 2005. Wikimedia Commons has media related to Sanctuary of Our Lady of Lourdes.